The Locate pane is the primary source to find a single address, return suggestions, and find features in layers on the map. You can find addresses and locations on the map with any of the locators added to your project using the Locate pane. Click the Locate button on the Map tab at the top of your project to open the Locate pane. The pane appears over the Catalog pane. In the Search text box in the Locate pane, type the address, place-name, or x,y coordinates you want to find. As you type, suggestions appear in a drop-down menu based on your input. The suggestions are generated by locators based on the settings you choose on the Settings tab of the Locate pane. You can press Enter to search based on text you enter in the search box, or you can click one of the suggestions to perform a search based on that text. 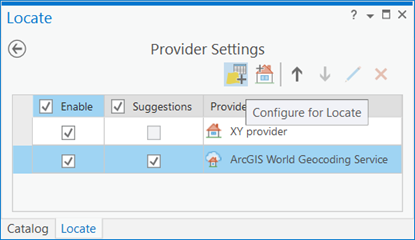 The Locate pane displays search suggestions generated from the ArcGIS Online World Geocoding Service as well as custom-built locators used locally or published as a service. If the address is matched, the address candidates display in list format under the locator that returned them, and they display as labeled points on your map. Optionally right-click any candidate to reveal the Zoom To and Pan To options, which allow you to perform their respective actions on the selected candidate so you can examine it more efficiently. Right-click a result from the list and select Candidate Pop-up to view a pop-up with detailed information about the geocoded result. To use locators in addition to the World Geocoding Service or geocoding services from your portal connection, add them to your project. To view the available locators in your project, use the Catalog pane. Open by default, this pane shares space with the Locate pane, so you may need to select it using the tab at the bottom of the pane. The Locators folder contains a list of available locators. Click the Locators button to expand the contents. The Locate pane provides a quick way to search for features and display the corresponding locations on a map. Add layers to your map so you can use them to find features using the Locate pane. The available layers in your map are listed in the Contents pane. Layers can be configured for search regardless of whether their visibility is checked on or off in the Contents pane. Click the Locate button on the Map tab at the top of your project to open the Locate pane. The pane appears over the Catalog pane. Configure the Locate pane to search for features in all fields in all layers in the map. Click the Filter button , and choose a Layer Search option. The Layer Search (Equals) option searches all fields in all layers added to the current map for any exact, case-sensitive matches to your input. The Layer Search (Contains) option searches all fields in all layers added to the current map for any match containing your input (case insensitive). In the Search text box in the Locate pane, type the characters or numbers that represent the feature or features you want to find, and press Enter. If features match, the results display in list format under the locate provider that returned them, and they display as labeled points on your map. You can right-click any candidate to reveal the Zoom To and Pan To options, which allow you to perform their respective actions on the selected result so you can examine it more efficiently. The Locate pane provides a way to configure layers to search on specific fields. These settings are saved with your project and transferred to other parts of the system through sharing as a package or a web map. Add layers to your mapto use them to find features using the Locate pane. Clicking the Locate button on the Map tab at the top of your project to open the Locate pane. 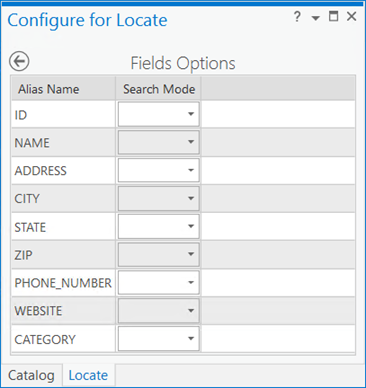 Configure the Locate pane to search for features by configuring individual layers in the map to search for matches in one or more fields in the layer. Click the Settings tab at the top of the Locate pane to view the settings. The Locate pane displays a list of available locate providers. There is also a list of locators that includes locators that were added automatically from your portal connection as well as those you added manually. Click the Add button, and click Add Layer to add a layer from your map to the Locate pane. The Select Layer pop-up appears, which lists all layers available in the Contents pane. Select a layer from the list in the Select Layer pop-up, and click OK. The Locate pane displays the Configure Layer for Locate view for the layer that you selected. For any field that you want to search against, choose either Equals, which allows you to perform exact searches, or Contains, which allows you to perform an approximate search. Click the Save and return to Settings button at the upper left of the pane to save your search configuration. A message appears indicating that the fields you configured for search should be indexed. Indexing improves performance and is helpful if your dataset is large and you'll be searching it frequently. The Locate pane displays the Settings tab, and your newly configured layer is displayed in the Locate Provider list. 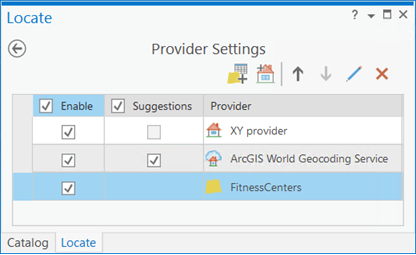 You can change the order of locate providers in the list, which determines the order in which a search is performed as well as the order in which results are returned and displayed in the Locate pane. In the Search text box in the Locate pane, type the characters or numbers that represent the feature you want to find, and press Enter. If you're searching against individually configured layers, as you type, auto-complete suggestions may appear below the Search text box. These are generated by geocoding services in your project that were built with suggestions enabled. Suggestions are not currently supported for layers configured for feature search. If the feature matches, the results display in list format under the locate provider that returned them, and they display as labeled points on your map. Right-click a candidate to reveal the Zoom To and Pan To options, which allow you to perform their respective actions on the selected result so you can examine it more efficiently. With locators and layers, you can find addresses, features, and locations on your map in the Locate pane.